The Russian Defense Ministry has published inaugural photographs of prospective military hardware to be commissioned in the upcoming years. The ministry has promised to demonstrate the hardware in the parade dedicated to the 70th anniversary of the victory in WWII. Information about the prospective vehicles and their photos were posted on the official website in the section devoted to the V-Day parade. They include a photograph of the T-14 main battle tank and the armored personnel carrier built on an integrated heavy tracked platform Armata. 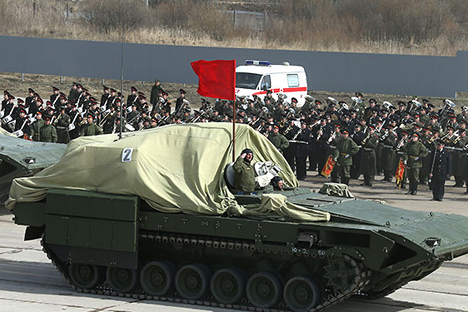 Both types will be represented by ten vehicles each in a mechanized column of the May 9 V-Day parade in Moscow. "The tank mounted on the Armata platform will be the main battle tank of the Russian Ground Forces boasting brand new performance characteristics and a new ammunition feed system," says a caption under the photo. As to the armored personnel carrier mounted on the same platform, "this unified heavy tracked platform has completely new performance characteristics, a new ammunition feed system, and separated crew and ammunition compartments," it said. Uralvagonzavod Corporation started to develop the heavy tracked platform Armata in 2009 for a main battle tank, a heavy infantry combat vehicle, a combat tank support vehicle, an armored recovery and repair vehicle, a chassis for self-propelled artillery guns, etc. The website also posted photos of other prospective vehicles, such as an armored personnel carrier on the Kurganets-25 platform which would be tested in the near future. It was reported earlier that outdated and poorly protected infantry combat vehicles BMP-1 and BMP-2 and armored personnel carriers BTR-70 and BTR-80 will be replaced by new-generation armored vehicles mounted on Kurganets-25 and Bumerang platforms. In all, the Russian Ground Forces will procure over 11,000 pieces of new and modernized armored vehicles before 2020.